I think these were quite possibly the best chocolate chip cookies I've ever made. 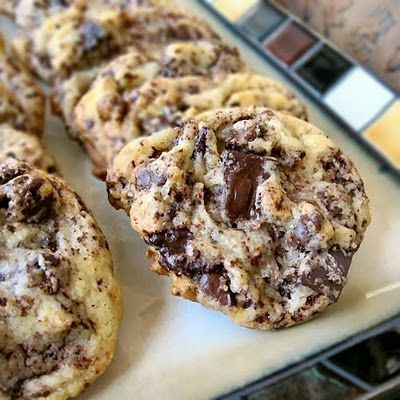 I also think that by grating the unsweetened chocolate, it made for a more consistent chocolate flavor throughout the entire cookie. This is definitely a recipe worth repeating. 2. Using a mixer fitted with paddle attachment, cream butter and sugars together until very light, about 5 minutes. Add eggs, one at a time, mixing well after each addition. Stir in the vanilla. Reduce speed to low, add dry ingredients and mix until just combined, 5 to 10 seconds. Stir all chocolate into dough using a wooden spoon. Press plastic wrap against dough and refrigerate for 24 to 36 hours. Dough may be used in batches, and can be refrigerated for up to 72 hours. 4. The original recipe recommends using 3 1/2 ounces of dough per cookie and baking six cookies per baking sheet, but I thought that made for an entirely too large cookie. So I dropped the dough by tablespoonfuls on to the prepared cookie sheet, then sprinkled lightly with sea salt and baked until golden brown, but still soft, 10-12 minutes. Transfer sheet to a wire rack for 3-4 minutes, then slip cookies onto another rack to cool a bit more. Repeat with remaining dough, or reserve dough, refrigerated, for baking remaining batches the next day.